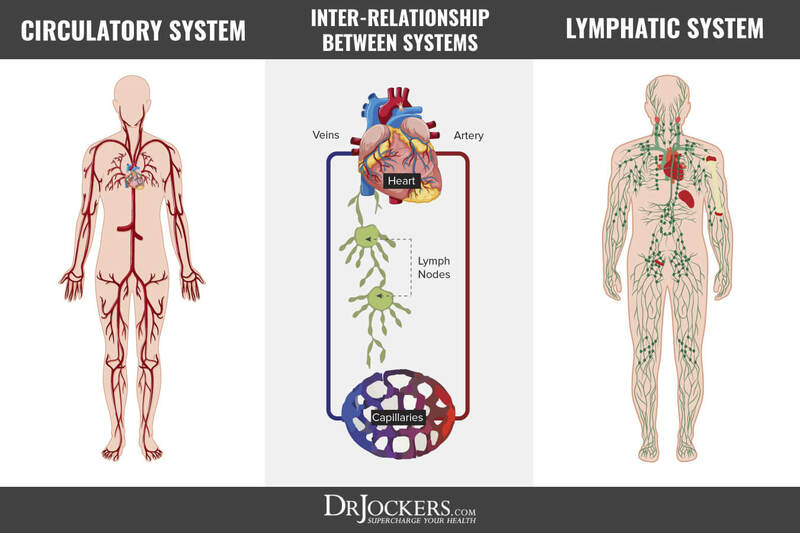 The lymphatic system is a major circulatory system in your body that has received far less attention than the blood vascular system. By no means does this mean that the lymphatic system should receive any less of your attention. Only since the turn of the 21st century have researchers begun to dig deeper into the dynamics of the lymphatic system and its influence on systemic or whole body physiology. A poorly functioning lymphatic system is associated with the development of chronic disease. This article goes into detail on how to improve your lymphatics and cleanse your system more effectively! The lymphatic system is analogous to the drains in your home. What adverse effects happen when there is a clog in any of the drains? An unpleasant odor arises, water too quickly fills the sink basin, the toilet doesn’t flush, particles such as food, hair and bacteria become stagnant in the drain, and eventually the source of the problem is unclogged and water and other substances it carries flow freely through the pipes again. Just like your pipes, the lymphatic system can become congested and lead to adverse health reactions including soreness of breast, fatigue, eczema and chronic skin problems, cold limbs, bloating, headaches, body rigidity, and weakened immunity (2). Regularly cleaning your drains to maintain their function is a good strategy to preventing a clog in a pipe. However, effectively purifying your lymphatic system is essential to your health and well-being. Follow these 10 detoxification strategies to improve the health of your lymphatic system. Exercising daily may be one of the easiest and most effective ways to boost the health of your lymphatic system. Whether you are lifting weights at the gym, dancing around your home with your kids, or going for a jog with the dog you are encouraging the health of your lymphatic system and improving immune function. Increasing the oxygen supply to tissue facilitates a healthy immune response and may prevent cancer. Exercise stimulates blood circulation and the transportation of oxygen to tissues and cells. The lack of exercise leads to an accumulation of toxins in muscles. Tumors thrive in a low oxygenated environment and this condition known as hypoxia promotes the invasion of cancer and its growth (1). 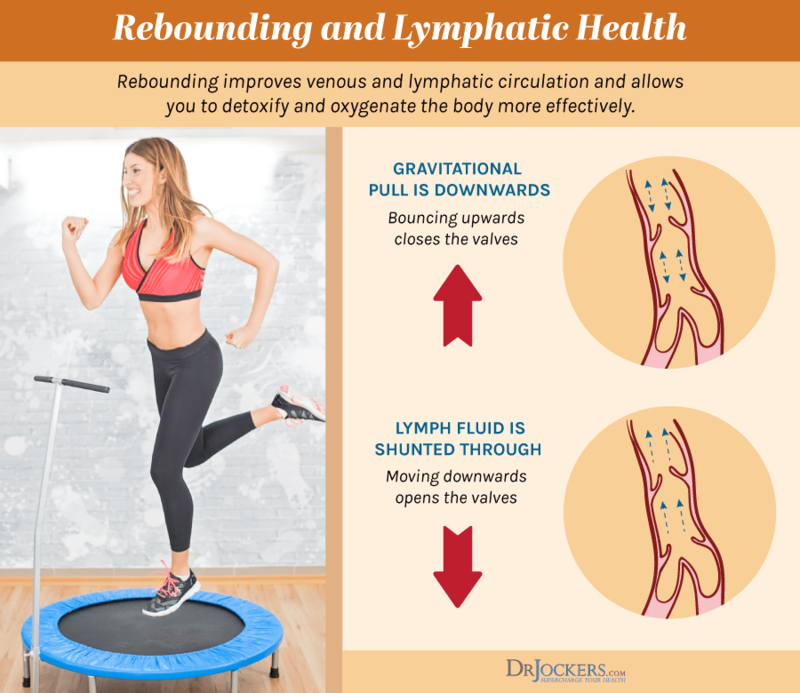 Another excellent way to purify the lymphatic system is through the practice of rebounding. Rebounding is a low impact exercise which involves jumping on a trampoline. Mini trampolines are offered which facilitate this practice at home. Rebounding promotes the flow of lymph through the body and is believed to increase the drainage of toxins from organs and muscle tissue. Rebounding is a fun and safe way to detoxify your lymphatic drains. You may have already heard that these techniques are good strategies to relieve anxiety and destress, but why do they support the health of your immune system? These practices relieve congestion and stimulate the circulation and detoxification of lymph through the body. When lymph becomes stagnant in extremities, a buildup of pathogenic substances, inflammatory markers and cellular debris is able to wreak havoc on the immune response leading to a decline in health (6). How is The Lymphatic System Cleaned? The lymphatic system flows to the thoracic cavity or upper chest region for the final drainage of toxins and ultimate cleansing. These stress reduction techniques encourage the contraction and relaxation of muscle which push debris out of organs and decreases the likelihood of debris build up and becoming stagnant. A simple stretch upon waking up is an easy way to initiate the circulation of lymph fluid throughout your body. When we remember to take deep breaths throughout the day, we are promoting intrathoracic pressure which improves the oxygen supply to our cells (3). Frequently our bodies are slouched over because we are consumed by work at the computer, bent over from emptying dish washers, folding laundry, picking up toddlers, studying at the desk and tense from every day anxiety triggers. One of the key mechanisms by which our bodies remove toxins is through perspiration. Participating in vigorous activity including intense exercise training is not the only mechanism by which you can improve lymphatic function. Infrared saunas offer a non-invasive form of light therapy which heats internal muscles and organs thereby pushing toxins into circulation for their removal from the body. Infrared technology offers amazing benefits for promoting the detoxification of the body and you can learn more about its healing powers by reading my article Detoxify Your Body with InfraRed Sauna. Many herbs detoxify tissue and improve the flow of lymph and removal of toxic substances. The following herbal treatments are some of the most well-known methods at ridding the body of toxic build up. Manjistha: Manjistha has been traditionally used in Ayurvedic medicine for reducing the toxic load carried by the body. This herb is most known for its ability to clean the liver and purify the blood. In the process, this herb boosts the process of detoxifying the lymphatic system. The consumption of manjistha tea is associated with improving skin problems, regulating menstrual conditions and stimulating the immune system. Essiac Tea: Essiac tea is believed to be an herbal treatment used for detoxification and improving immune system function. Essiac tea is an alternative health supplement which may be advised for newly diagnosed cancer patients to strengthen their immune system. Milk Thistle: This herb contains powerful detoxification properties which help purify the liver, kidneys, GI tract and stimulate thyroid function. Milk thistle contains antioxidants which not only fight inflammation but also stimulate the production of other immune supporting healing agents such as enzymes and other antioxidants. Essential Oils: Essential oils used in aromatherapy are an ageless tradition and herbal medicine composed of plant compounds which offer therapeutic properties. The PDQ Cancer Complementary and Alternative Medicine Editorial Board summarizes evidence-based information for the use of aromatherapy and essential oils and reports that essential oils exhibit a response known as neuroimmunomodulation (4). The Ayurvedic practice of dry brushing boost circulation and therefore also boost lymph flow and detoxification. As previously mentioned, perspiration is only one avenue to remove toxins from the body. Dry brushing helps to remove dead skin cells and toxic waste as well as stimulate sweat glands by opening pores and promoting underlying lymphatic circulation. Dry brushing can improve the quality of your skin and boost immunity. This practice is as simple as using a coarse bristle brush and moving the brush along the skin and towards the heart. Read more details about the topic at Dry Brushing to Detoxify Your Body. Consuming a diet of anti-inflammatory foods, specifically raw fruits and vegetables helps to hydrate the body and promote an alkaline environment. Pathogens cannot flourish in an alkaline environment and the consumption of fresh and healthy foods expedites the removal of pathogens which may be stagnant in lymph fluid. Especially as you age, consuming a healthy diet rich in antioxidants and healthy fats is required for moderating immune response. Lymphatic vessels contained in the intestines are easily susceptible to dysfunction as a result of an unhealthy diet. Hydration is key to the proper health and function of the lymphatic system as it is primarily made up of about 95% water (5). Sipping on lemon water is a great detoxification strategy because it not only hydrates the body but it also encourages an alkaline environment (3). Drinking purified water is important in order to avoid adding more contaminants into our bodies needed for removal. One very simple mechanism to avoid the restriction of lymphatic vessels which may hinder the adequate flow of lymph fluid is choosing your attire appropriately. Wearing restraining, tight fitting under garments such as wired bras can cause the inability for fluid to be drained from the breast, arms and chest into surrounding lymph nodes. It is especially recommended to never wear tight fitting clothes while sleeping. Studies have shown that stress reduction exercises, especially a massage, improve immune function. Connective tissues massages such as shiatsu massage has been shown to relieve symptoms of chronic pain and fatigue (8). Therapeutic self-massage treatments can be found online and offer techniques for increasing the flow of lymph fluid throughout the body. Patients whom suffer from the most common lymphatic disease known as lymphedema can benefit from a type of massage called the Manual Lymph Drainage technique, that is performed by specialized practitioners (3). Massage is a great lymphatic decongestive therapy that can be coupled with essential oils following a cleansing Epsom salt bath to improve your lymphatic system. In the same way that the force of gravity encourages the flow of lymph towards the heart for purifying during yoga and pilates practices, inversion tables at your local chiropractor offer the same benefits. You can also mock this same effect by placing your legs up on the wall or lifting your lower body up using your shoulders. This technique increases lymphatic drainage which is also supported by rebounding exercises. Promoting the health of your lymphatic system is especially critical in individuals with cancer. Treatments to boost lymphatic flow have been shown beneficial to treating pneumonia and are advantageous to increasing defensive immune agents such as cytokines in the lymph vessels of the thoracic and intestinal regions (7). Decrease the sympathetic nervous system associated with cardiovascular issues and increase parasympathetic nervous system function responsible for promoting immune function. Increase the removal of toxic waste from the body. Boost lymph and blood circulation and also improve the health of the lymphatic system. The proper functioning of the lymphatic system is fundamental for the health of the immune system and homeostatic functions. The lymphatic system is required to oxygenate cells, eliminate waste and requires daily attention to effectively detox from the chemical exposure in our foods and environments. Incorporating these methods to improve your lymphatic system is critical to your health. I designed the Cancer Cleanse program to help people navigate these strategies and more to improve circulation, lymphatic flow and overall toxin elimination to improve the health of the immune system. Thank you for all the GREAT and much needed information you have been sharing. It has been a Godsend and seems like it appears just when we need it, the more I learn about my daughter’s severe eczema. So grateful. Thank you Viki! So glad you are getting a lot out of this and we are praying for you and your daughter’s health! You web name implies that you are a certified doctor. Are you in fact a truly certified doctor and is you site ‘speaking’ from a medical point of view or from a naturalpathic pint of view. I am a Doctor of Chiropractic, so we view things from a holistic lifestyle perspective. Hope that helps! I really enjoyed your presentation and YouTube video. I’m going through phases right now with my health where I am working in me. I have a lump in my neck and went to chiropractor and he said it was a muscle spasm. He pop my neck but it still there. I been drinking plenty water, and keeping hot rag on it to try loosen it up. Can’t really tell if results yet, but I saw your video and wanted to connect to see if you have suggestions.